Kamishibai is picture stories developed out of the Japanese traditional culture of Etoki, which is the telling of stories while showing pictures. A more developed style of Etoki can be traced back to 12th century Japan, when Buddhist monks used Emaki (picture scrolls) to convey stories with moral lessons to a mostly illiterate audience. As a predecessor of today's Kamishibai, Emaki were drawn on a single scroll and pulled across a screen to create a moving picture effect. The most famous of these Emaki is "Genji Monogatari Emaki", a picture scroll based on the 11th century "Tale of Genji". Today's Kamishibai have evolved from a form of street-storytelling which was popular throughout Japan from the 1920's into the 1950's. The Kamishibai storyteller was also a candy seller. 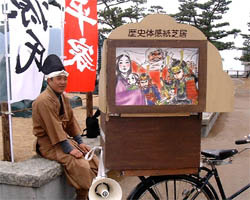 Riding a bicycle equipped with a small stage for showing the story cards, he would enter a village or neighborhood, dismount and loudly strike together two wooden clappers, called hyoshigi, or allow a lucky child to do so. The sound was a signal for children to run from their homes and gather around him for a story time. Those who bought candy got to stand nearest to the stage. Then, in a dramatic manner, he would start to tell 2-3 Kamishibai episodes. He would not tell the whole story! The stories were told as continuing serials, that is, he would always stop at an exciting moment, leaving the children impatient for his next visit. The revival of Kamishibai can be tied to the global depression of the late 1920s when it offered a means by which an unemployed man could earn a small income. With the advent of television in 1953, the itinerant storyteller gradually disappeared from Japan's streets. in recent years, however, Kamishibai have enjoyed a renaissance in Japanese schools, libraries and culture centers.